Infant First Aid courses held in Chipping Norton and the Wychwoods. More than 1,000,000 children a year in the UK are involved in a serious accident in the home! It only takes seconds for an accident to happen. Why not learn how you could save your child's life or that of another loved one? It’s really very easy!! We are delighted to have teamed up with First For Safety, to bring you a comprehensive two hour first aid class. The First For Safety instructor is a ‘Mummy’ First Aid Instructor with more than 21 years’ experience in the Emergency Services. Babes in arms are welcome, until the time they are on the move! 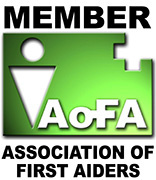 First For Safety is proud to be an approved member of AoFA.